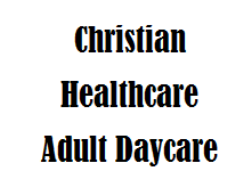 The Mann Center of North Carolina is proud to serve as the base location for Christian Healthcare Adult Daycare. This locally-based non-profit organization provides quality daycare for elderly and disabled adults in the Sanford and Lee County community. Clients of the facility receive group interaction, socialization & recreational activities, nutritious lunches & snacks, a safe supervised setting and medication administration as needed, all in a supportive environment. In addition to aging adults, Christian Healthcare Adult Daycare serves stroke victims, persons with dementia, Parkinsons patients and individuals who are suffering from other ailments or handicaps. To learn more or to discuss enrollment procedures please call 919-775-5610 or 919-774-8788, email wmarsh55@gmail.com, or visit the Christian Healthcare Adult Daycare website.